Last night we had an interloper from Revolution Radio (96.2FM) and he actually came and joined in the class. We were making Christmas cards and I think he quite enjoyed himself. He said he was a bit scared at first, of a room full of ladies but it didn’t take him long to settle in. After all, we are a friendly bunch and I feel he may well be back! He did a great job and even though he had never done anything like this before, his cards were great and I think he was secretly very proud of himself. I’m not sure what his wife must have thought when he arrived home with glitter all over his face! 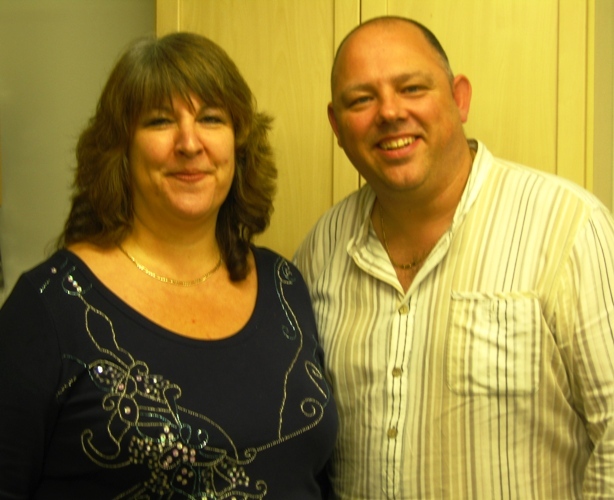 So, here I am with Alan and the show will be broadcast on Friday at 2pm on 96.2 FM Revolution radio. Try to listen in if you can. So here is one example of the cards we made. It features nestabilities, Lacy Circles, Classic circles, a Marianne flourish and a couple of punched snowflakes. Hope you like it. Had a brill night, thanks for letting me share it with you. So glad you were there,and that you could join in. I think he was having far too much fun to be working! made this card with you on Monday, love it. Fab blog & brilliant shop, if anyone up Greenfield way you must call in – I am so lucky to have such a lovely shop on my doorstep – sadly work does get in the way of me visiting more often – lol!! Hello! I havent visited your shop for ages! I am the woman with the purple hair whos other half it the Gardener & Guitarist from Milnrow! Great to see your Blog! I have become a follower so I can keep up with your doings! Hope to get over soon! 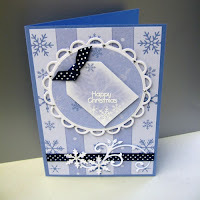 Take care!….and if you have time pop over to my Blog & have a peek at some of my cards.